SXSW is an other-worldly experience. Austin, Texas, our beloved hometown, becomes unrecognizable. Buildings are transformed to look like sets from movies, live music is around every turn, and celebrities can be spotted reciting poetry on the street. Being equal parts festival, conference, party, and immersive experience, SXSW often feels like spring break for adults. I find it's a great time to observe trends in the tech industry and get a deeper understanding of where we’re heading so I can navigate Voxable’s course into the future. Here are a few of my takeaways from SXSW this year. Ethics in technology is a necessity. The general public, politicians, and entire nations are starting to grapple with the detrimental impact technology, big data, and algorithms can have on our world when design and business are not approached thoughtfully and ethically. It seems like tech companies are failing us left and right in this respect. It’s not just huge corporations; I’ve seen firsthand the way startup culture can prioritize wins for investors over wins for users. When we use capital as the only measurement of value, we deprive ourselves of many ways technology can advance humanity. Since every company in every industry is relying more on technology, it’s paramount for us all to confront the ethical dilemmas that arise with its use. Discussions about ethics in technology are moving to the forefront, and thought leaders are sharing their perspectives on how to approach ethical design. As a CEO and designer, I believe we need to have more dialogue about the practical implications of ethical design and how to make impactful changes from education on up to C-level decision-making. Even those not convinced by the altruism of ethical design should think about their future consumers – specifically consumers in Generation Z, who are incredibly ethically-minded and seek out products and services that align with their values. Marginalized people are powerful, yet woefully underrepresented in tech. I draw so much motivation from getting together with other women to discuss creativity, tech, society, and our experiences in male-dominated workplaces. Recently, there have been a lot of spaces created for women and other marginalized groups to come together to talk about the industry. These spaces are much-needed advancements for inclusion and diversity in tech. However, when we look for real signals of change, we still don’t see them reflected in important areas such as funding, hiring, and promotions. Issues that impact women and other marginalized people are currently receiving an incredible amount of visibility, but change can take time. We have to remain vigilant if we want to see the change we seek on a large scale. That means we must recognize our personal privileges and biases and work together to find solutions that effectively break down those barriers. On my own perch of privilege, I still struggle to find meaningful ways to be inclusive and support others in the tech industry struggling for representation. I think it’s vital to learn from one another to gain understanding of what it means to be an ally. Culture is a product of a company’s vision and mission. It’s created at the top. A vision and mission is the cornerstone of a company. It’s necessary for every company to invest in developing and communicating their vision and mission. Culture arises out of this mission and vision, so it trickles down from the top. In many companies with toxic workplace cultures, there are systemic issues originating from leadership and the lack of a unifying vision and mission. As the CEO and co-founder of my own company, I place immense value on a clear, purposeful mission and vision. Once solidified, a mission and vision can be the guiding light for everyone – from a company's leadership and employees to its customers and audience. As technology becomes more intimately woven into humans’ daily lives and consumers demand more ethical design, I predict vision and mission will be a differentiator between companies that succeed and companies that fail. Design is becoming more complex as we build intelligent and immersive experiences. As technology advances, brands must determine how to traverse between AI, VR, AR, conversational interfaces, and the plethora of new, relatively cheap technologies gaining market share. Correspondingly, users demand more from digital products as their expectations for service, ethics, and innovation increase. There are young brands like Bumble and Outdoor Voices adeptly crossing this new tech terrain and capitalizing on the immersive experiences their audiences crave. Design companies now have the impetus to invest in more collaborative, cross-disciplinary processes for building these rich experiences. I recently recognized that having a deep understanding of emerging technology in my field means not only being aware of the interfaces that exist, but also being able to convey their benefits and risks to others so we can approach their design in an ethical manner. I work alongside employees and partners who have a similar viewpoint and want to deliver such innovative, thoughtful products to users. There is a TON of room for innovation. One thing that is just as true today as it was yesterday: there is a TON of room for innovation. Surveying the state of tech today, I see so many uncharted spaces to explore and opportunities to make the world better. I’m excited about all the new experiences we can create and technologies we can incorporate into our everyday lives that will allow us to be more imaginative, more innovative, and more superhuman. I appreciate living in a city that fosters local technological advancement and also hosts massive events like SXSW to bring together global thought leaders across all industries. In Austin, I’m constantly inspired and motivated to innovate. Innovation is about finding ways to make our world better; we do that by evaluating where we are now, considering where we want to be, and imagining how to bridge the two. I know there is a lot of work ahead of us to ensure the technology we build is moving humanity in the right direction. 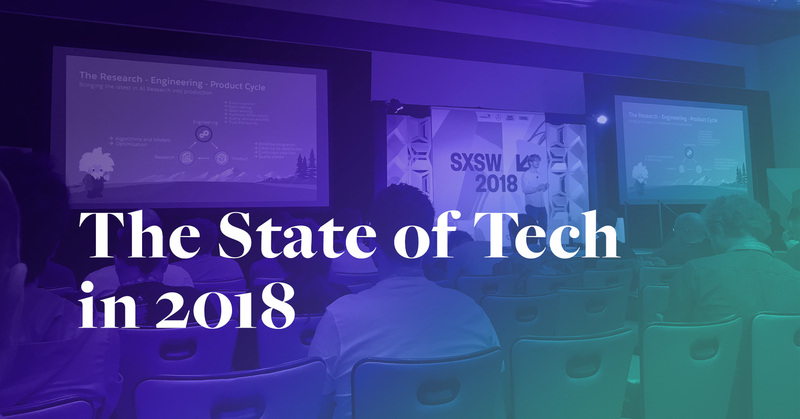 After attending SXSW 2018, I’m optimistic for the future of technology and proud to be a part of the community building it.